World wide delivery with Tracking. * This guard is hand made, just like yo rockin' mama, so there may be slight variations in the mix. Vortex can be made for other Tele guards, please email me your request (email top left). The Vortex is directional hand designed and polished 100% non-magnetic stainless steel, corrosion free. No color is added, it's polished silvery surface is naturally reflective. Light reflects from different directions like 3D, following the direction of the polished surface. 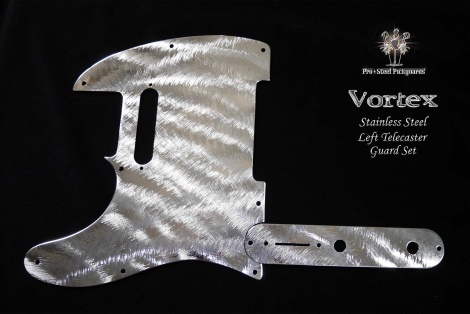 See Vortex fitted to a customer's lefty Tele here. This particular surface design is hand made. After you place this order, the photo of your completed guard will be sent for your aproval before shipping. Light weight, very rigid, only 0.9mm thick, weighs just near 2 plastic guards. Also works as a noise shield. FITS - Genuine Fender USA or MiM Left Hand Telecasters: Standard, Deluxe, Vintage, Modern Player, Select, Special, Baja, Modern, Esquire, and Signature models. Any Tele that a standard Fender Left Hand Tele guard fits. Japan Tele's: Please test first if a Mexi or USA Tele guard fits your neck cut. If your NECK heel cut is LARGER, please advise me when ordering. Squiers Tele's: Will fit recent Squier Telecasters, This guard has exactly the same external shape and screw holes as a Standard Fender Tele Guard.